This week's Free GM Resource (I am aware I missed last week) is another great tool that has absolutely NOTHING to do with gaming, but has been quite useful for me in game prep. 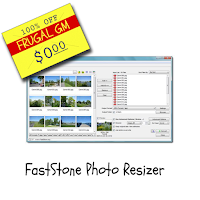 FastStone Photo Resizer is a free program that doesn't have any adware/spyware/limited features for use. Yes, on the surface this program resizes photos....and it would be worthwhile if that is all that it did. Why would a GM need to resize "photos"....or more appropriately graphics? Well if you are running a Virtual Table Top (VTT) game, FastStone Photo Resizer can take all of your 300 DPI graphics and reduce them to something more appropriate, like 100DPI. Now the cool thing about this program.....well, there are quite a few cool things, but as far as resizing goes, you create an input list of files to tweak. This means you don't have to have all the original files in one directory. You can not only resize your graphics, but you can rename them AND change the file types (.JPG to .PNG, etc). You can have the new graphics be dumped into a folder of your choosing and/or have the old files over-written (which I wouldn't recommend). You can also use FastStone Photo Resizer to simply rename a batch of files, which is quite useful as well. What I like to do is get everything I need for one encounter together in one place, not a folder, but an input list, tweak as needed, and then have the encounter in a new folder with appropriate names. FastStone Photo Resizer is really worth a download!